Last week, I came back to Berkeley early to conduct interviews for The Berkeley Group with Cindy and Michael C. (of FF Iron Chef fame). Our interviews spanned 4 days, with 2 days dedicated to San Francisco. We stopped for quick meals and uncovered quite a few hidden gems. This is part one of our food adventures. 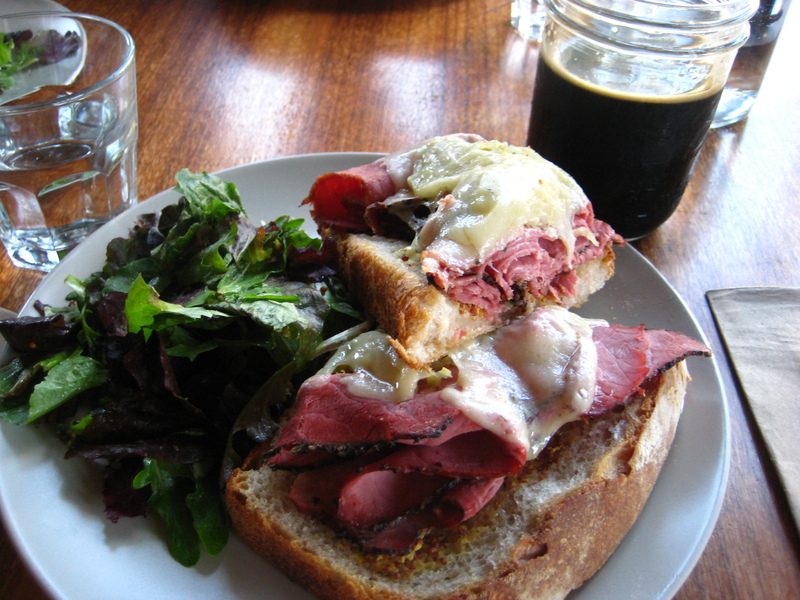 A perfect lunch: Michael's hot open-face pastrami sandwich with a dark beer. By the time lunch rolled around on the first day of interviews, we were in the Sunset district with access to a car. We originally planned to go to Chou Chou, a reasonably priced French bistro, but to our disappointment it was not open. I opted to phone-a-friend and call my trusty pal Chuck, a Yelp Elite, who in turn recommended we check out a sandwich place closer to Golden Gate Park. Outerlands is delicious, reasonably-priced ($4-12) “new American” cuisine in the most random neighborhood. It reminds me a bit of Gregoire in Berkeley, although the food is far from “gourmet.” Located on the corner Judah Street at 45th Avenue, it is hidden in a three-block stretch of Chinese restaurants; we actually drove past it twice before finding it. Its exterior is unassuming, but a step inside (past the tricky door) offers an entirely different experience that somewhat recalls the style of Disneyland’s Splash Mountain. I’d never had an open-faced sandwich before, but a few tips from the friendly girl behind the counter helped make our order decisions. Michael ordered a pastrami sandwich; Cindy ordered a honey ham sandwich with cheddar and dates which had been soaked in red white; I ordered a grilled cheese with a side of their soup of the day, a carrot soup. Michael also bought a darker beer, after another staff member recommended which beers to pair with the pastrami. When the food arrived, we were pleased by the size of the portions and quality of the food. Outerlands bakes its own sandwich bread; it is very thick, similar to the brioche/French toast served seat La Note. Consequently, the sandwiches were much more hearty and filling than expected, and all of us ended up boxing half our sandwiches for later. Michael’s pastrami, pictured earlier, was a solid order. Michael said that the beer, which came with a hefty price tag of $6 a bottle, complemented the dish very well. He remarked that he would return in the future if in the area. My grilled cheese was described on the menu as “brushed with garlic butter” and “seared on a cast-iron skillet.” This was the best grilled cheese sandwich I have ever had, hands down. The bread was much thicker than anticipated, but the inside was still wonderfully fluffy despite a crunchy crust; the cooks used a blend of swiss and cheddar in the center. 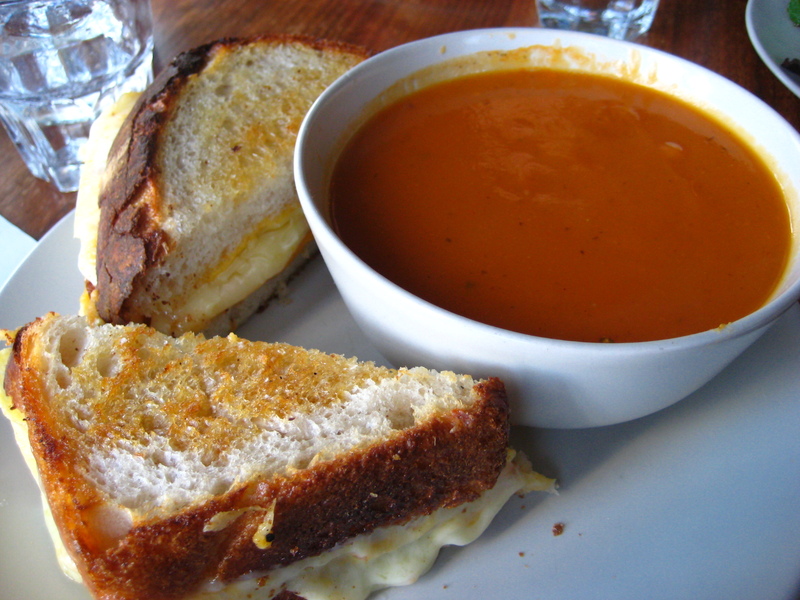 Grilled cheese sandwich brushed with garlic butter and seared on a cast iron skillet; side of spiced carrot soup. Dip to achieve optimal taste. The sandwich cost $4, and I paired it with a side of their soup de jour, spiced carrot soup. I normally hate cooked carrots, but the flavor of this soup was very good; rich, spicy, and only carrot-y at the end. To make my dining experience especially tasty, the staff advised me to dip the grilled cheese into the soup. All I can say is that I’ve come to appreciate what a difference garlic and pepper can make! This was my personal favorite of the three meals, and I will definitely be coming back for more. The best sandwich that was most unique was Cindy’s; it was a unique taste that was pleasantly surprising. 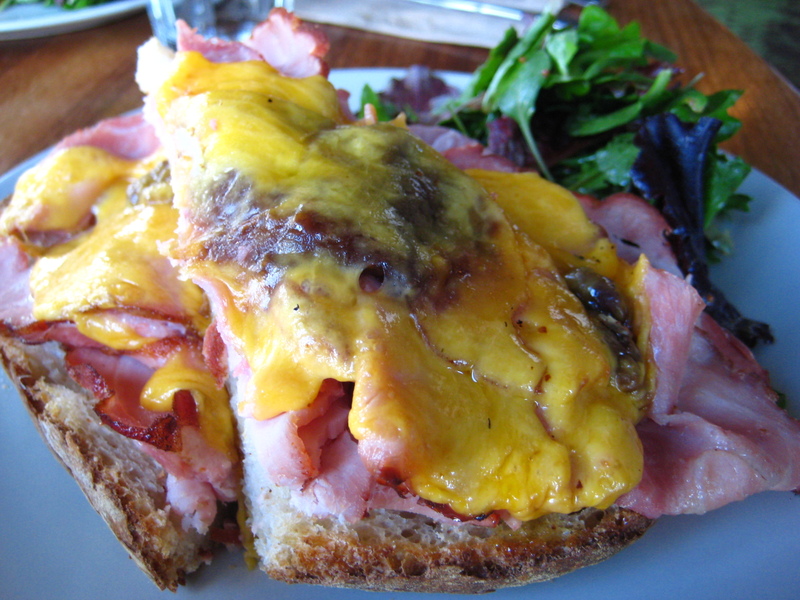 Cindy's open-face sandwich: honey ham with cheddar and dates soaked in red wine. Normally, I’m not a fan of honey ham–I find it too sickly sweet for my taste. However, the dates helped cut through the heaviness of the meat, making for a delightful sandwich. One thing that I didn’t like as much was the cheese; I felt that they could have cut back to make a more balanced sandwich. Aside from this easily alterable note, Outerlands was the perfect place for a quick lunch. If you’re heading towards the Sunset, I definitely recommend you give this place a try.